Welcome to Day 8 in the 31 Days of iOS. In yesterday’s article, we discussed how to perform network requests using the NSURLRequest and NSURLConnection classes. We showed two different methods of making these requests: one of which required us to implement several delegate methods and the other made use of a new technique called a block. Today we’re going to continue where we left off and talk about how to change from doing a GET request to doing a POST request. 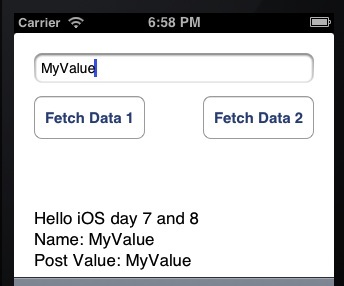 We’ll also look at how to change the content type and post JSON data. You can start out with the code we finished up with yesterday or, if you’d like to follow along with the completed code, you can access it here. When we run the app now, nothing will be different from yesterday. This is because the web page we’re posting to is capable of handling both GET and POST requests. Frequently you’ll find that when you need to post data to a web service, a GET request will not work at all. While that works, what we really want to do is figure out how to post JSON or XML. First we need to generate a NSDictionary with the key-value pairs that will go in our JSON. We then use NSJSONSerialization to convert the NSDictionary into NSData. That object is then used to set the HTTP body of our request. Notice the use of the NSJSONWritingPrettyPrinted option. Using that causes the JSON that is generated to be “pretty” or contain whitespace. This is useful for debugging, however, it isn’t the most efficient way to send data over the wire. To get the most minimal JSON possible, this flag should be removed so unneeded whitespace isn’t generated. Today we continued to look at how to perform network requests from iOS apps. Now we know how to do different HTTP requests as well as send data over the wire (in addition to as part of the query string). We also looked at how to send JSON data over the wire as that is a very common practice when communicating from mobile clients to web servers. The knowledge from these two posts should prepare you for doing just about any network communication. You can access the finished source code from this article here.